Coppercube 5.4, a full WYSWYG editor experience for HTML5 game development, just released version 5.4 as a free updated. If you want to sculpt your 3D world terrain with another software, you can do this now, too. Coppercube now is able to import terrain heightmaps of the formats .raw, .r16, .r32, .png, .tga and .pgm. It also has the option to automatically apply textures to imported terrain and distribute grass onto it. CopperCube now has an integrated texture packer. This is useful if you are using 3D models (for example downloaded from the web) which weren't optimized for games. Most of 3D models available online have lots of textures applied to them, which slows down your game while rendering. You can now simply right-click such a model in your game, and select "Modify -> Pack all textures of selection into one". This will optimize your 3d model and make it render much faster. CopperCube now generates up to -80% smaller files for WebGL (depending on content). Files are now compressed, causing WebGL websites to download and start much quicker. This feature is optional and can be turned off in the publishing settings. The first person shooter camera now has a new property named 'movement smoothing', which when turned on causes the movement of the player to be much softer, even on very slow systems. This is nice especially for mobile apps and the WebGL target, but movement also on the Windows and Mac OS X apps feels now much more natural, when turned on. There is now an option in the publishing settings to enable your game/app to use the full web page size. It is now possible to play foot step sounds easily. Simply attach the 'footsteps' behavior to any object, and once it is moving, one random of three actions is run, after a specific foot step length. Use those actions to play sounds, blow up dust, or similar. The footstep behavior is available as free downloadable extension behavior from the extension download page here. The "On proximity do something" action now has a setting named 'testArea'. Set this to 'box' instead of the default 'sphere', and your objects will be tested against a box, which is more exact and useful in a lot of cases. Also, the box is rotated and scaled with the object, so you can also test for non-orthogonal areas now. You can now specify if a 2D image drawn as part of a 2D Overlay will be drawn 'sharp/pixelated' or 'blurry/filtered' when it is scaled. Both options make sense, depending on the type and use case of your 2D overlay. Now you can choose manually which option will be used. The command for recalculating tangents and binormals, which is intended to be used for normal mapped geometry only now also works for all kinds of static geometry. It has also been renamed accordingly "Recalculate normals and tangents...". You can use it to recalculate and fix normals for all kinds of static meshes now. If you are using the model viewer camera behavior, you can now enable pan for it. This works when pressing both mouse buttons at the same time. It is implemented inm the downloadable extension behavior 'Model Viewer Camera Extended' from the extension download page here. The .obj file importer is now more compilant and can even import corrupt .obj files found on the web. It is also now able to import files correctly, exported with some newer version of a more popular 3d modelling software, which seems to add some unexpected characters into the file sometimes. WebGL performance is now much better, on all browsers: Internally, the engine now uses requestAnimationFrame() if this turns out to perform better on the target browser. A handfull of smaller bug fixes. Phaser, the cross platform HTML5 based game library I covered in this tutorial series, just released version 2.4.5. 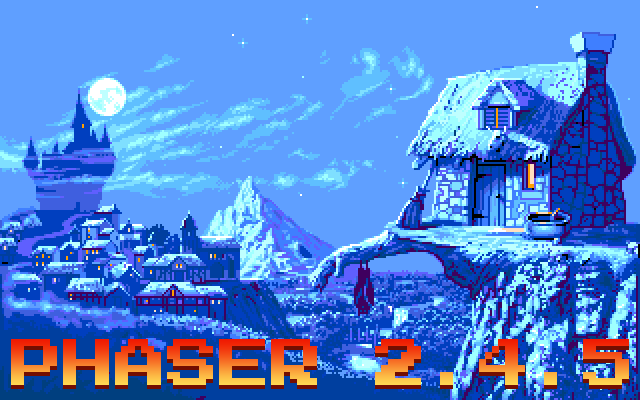 Phaser 2.4.5 is our first release in 2016 and represents several months of fixes and optimizations. As a point release it's a safe update from a previous 2.4 build, but as always please test first before upgrading, and be sure to skim through the extensive change log. There are some great new features including Dolby Digital sound support, loads of updates to Pixi and a new Webpack bundle. 30 updates including replacing PolyK with EarCut, Tilemap updates and lots of TypeScript and JSDoc updates. 31 bug fixes including OS X Chrome right-click issues, Sprite mouse over, Tween event order, Loader queue fixes and more. 10 updates to our build of Pixi including CanvasPool tweaks, fixing generateTexture bounds calculations and Filter Texture and GL Viewport fixes. Due to on-going development of Lazer (previously known as Phaser 3) Phaser is soon to enter the LTS (long-term support) stage of its life. This is when we impose a feature freeze, locking the API down and responding only to bugs. This is a necessary step to allow us to focus on Lazer while still ensuring Phaser is given the support it deserves. Thousands of developers use Phaser and we've no intention of ignoring that. However with the release of 2.4.5 we will now be moderating issues opened on GitHub to this effect. In the first tutorial we looked at installing Superpowers, running the server and creating our first project. In the next tutorial we got to know the editor, the relationship of Actors and Components and finally created a camera for our game. In this tutorial we are going to draw a sprite on screen, then a sprite sheet which will enable animation. So without further ado, let’s jump in. There is one more important part of the relationships in Superpowers to understand. As we’ve seen already, our Scene is composed of Actors, which in turn are made up of Components. Components however can have Assets. Assets on the other hand are NOT part of the Scene. They actually exist at the same level as the Scene and can be used in multiple scenes. Assets are declared on the left hand side of the interface. You could also modify the pivot point of the sprite by changing the origin position. The default of 50% will put the pivot point in the middle of the sprite, so this is the point the sprite will be drawn and transformed relative to. You can also configure the opacity, how the sprite is rendered, etc. The Grid Size parameter is used when you have multiple sprites in a single texture, which we will use later. The sprite can be positioned using the transform widget, or directly in the Transform component on the right. Congratulations on your first successful game! When prompted enter the number of rows (1) and columns (3) in your image, or simply enter the width and height of each frame of animation in the text boxes. Now lets create a new animation named walked. Simply click the New button under animation, name it walk. Then in the settings we set (I believe, the UI does not make it obvious), the first frame of the animation, the length and the number of frames to step by. I also set the animation speed to 3 frames/sec meaning our 3 frames on animation will play once per second. Ignore the twitch, that’s just me capturing the animated gif at the wrong end point. While this one is certainly skirting the border of game development news as almost no games were developed for Firefox OS, but the death of an OS generally merits at least a few lines of text. Started in 2011, the first Firefox OS device shipped in 2013, FF OS was designed as a Linux kernel that booted to the Firefox browser. Very similar in scope to Chrome OS, it received even less success than Chrome OS, which itself is on life support these days. Even the idea of a mobile OS built around a web stack wasn’t new, as Palm, then HP attempted it with WebOS, another mobile HTML5 powered operating system that has joined the operating system graveyard. I don’t know about you but to me this one seems to be a non starter at this point. It’s actually a bit of a shame too as iOS is getting worse with every release and frankly I trust Apple or Google about as far as I can throw a transport truck, so a viable free and open option in the OS space would certainly be a good addition. The purpose of this email is to share a follow up to what was announced by Ari Jaaksi, Mozilla’s SVP of Connected Devices, in early December49 -- an intent to pivot from “Firefox OS” to “Connected Devices” and to a focus on exploring new product innovations in the IoT space. We’re sharing this on behalf of Ari and the Connected Devices leadership group. We will end development on Firefox OS for smartphones after the version 2.6 release. As of March 29, 2016, Marketplace will no longer accept submissions for Android, Desktop and Tablet, we will remove all apps that don’t support Firefox OS. Firefox OS apps will continue to be accepted into 2017 (we have yet to finalize a date for when we won’t continue accepting these apps). The Connected Devices team has been testing out a new product innovation process with staff, 3 products have passed the first “gate” and many more are in the pipeline. Having multiple different product innovations in development will be the approach moving forward, and we’re hoping to open up the formal process to non-staff participation in the first half of the year. The foxfooding program will continue and will focus on these new product innovations (rather than improving the smartphone experience). We expect the Sony Z3C foxfooding devices to be useful in this, but we expect it to take until the end of March to figure out the specific design of this program. Obviously, these decisions are substantial. The main reason they are being made is to ensure we are focusing our energies and resources on bringing the power of the web to IoT. And let’s remember why we’re doing this: we're entering this exciting, fragmented space to ensure users have choice through interoperable, open solutions, and for us to act as their advocates for data privacy and security.